I meant it as a tongue-in-cheek jibe when I coined the name "Bandung Vader". Then one day, I actually found a picture of this character on the intarwebs. Granted that the girl in the picture was not the actual Bandung Vader that I was referring to, but to see an actual picture of a Bandung Vader is absolutely awesome! 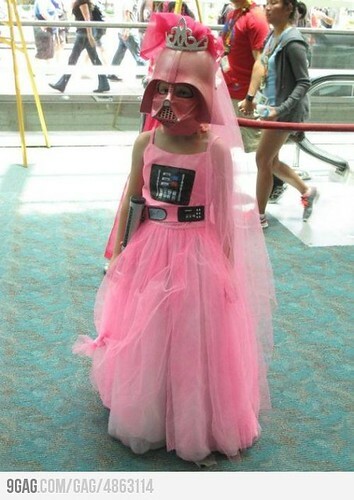 Who (other than my warped mind) would have thought of a pink princessy Darth Vader? p.s. Looking at the expression of her eyes in the photo, it almost seemed like the little girl was forced into the costume. Together with the slouched shoulder, is it me or does anyone else also detect the LanLan-ness in her eyes? It was an old running joke from a long time ago back in the day when blogging was all the rage.